Bargany Gardens is an extensive 50 acre mature woodland garden with a fine show of azaleas and rhododendrons and magnificent fir trees. Bargany Gardens are noted for the variety of azaleas and rhododendrons, and the planting around the loch is stunning in springtime. There are fine specimen trees to admire, a rock garden and a walled garden (disused) but surrounded by flowering shrubs and a cherry orchard. Open daily in May – 10am to 5pm. Please leave entrance fee in the honesty box provided. £2.00 per person. Plants on sale from the walled garden. The present structure of the designed landscape at Bargany Gardens dates back to the early 19th century with only a few features surviving from the earlier formal landscapes. 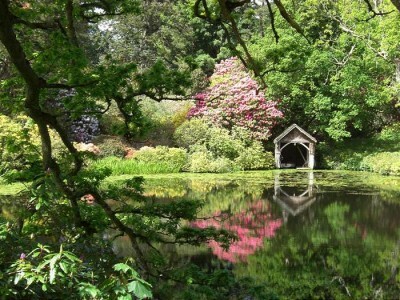 As well as grazed parkland, there is an early 20th-century woodland garden and rock garden which house displays of rhododendrons and azaleas. The early 19th-century walled garden has a small semi-circular garden at one end with interesting trees and shrubs. In the mid-18th century there were tree-lined parks, avenues and a formal wilderness. An improvement plan for the Bargany Gardens and policies was made in the late 18th century by William Adam, W. Bouchart and George Robertson. The present structure of Bargany garden dates to around 1826 when Willam Sawrey Gilpin worked on the park. In the early 20th century a woodland garden and a rock garden were created by Colonel Sir North Dalrymple-Hamilton. The house was restored in the late 20th century and the gardens are being continually maintained. We have a charming holiday cottage available to rent within the gardens. Sleeps 4.